4 COOLPIX L-series cameras, including a high-power zoom model equipped with 34x optical zoom and an approx. 921k-dot flexible tilting monitor, a compact model equipped with 26x optical zoom, and two models that enable simple, stress-free shooting. TOKYO - Nikon Corporation is pleased to announce the release of four new COOLPIX L-series cameras—the L830, L330, L30 and L29—developed with an emphasis on ease of use and functions that make these digital cameras fun to use. The L830 is equipped with a high-power zoom NIKKOR lens offering 34x optical zoom that covers a broad range of angles of view, from the wide-angle 22.5 mm to 765 mm (equivalent focal lengths in 35mm  format). It is very compact, despite also being equipped with a 3-inch, approximately 921k-dot (RGBW) tilting TFT LCD monitor with wide viewing angle that makes shooting from any angle enjoyable. The L330 is a model that continues the elegant design of L-series cameras. It has a compact body, despite its effective pixel count of 20.2-million pixels and a 26x optical zoom NIKKOR lens that makes shooting of a wide variety of scenes, from wide-angle to telephoto, possible. The L30 and L29 are compact digital cameras that make shooting easy with intuitive operation. 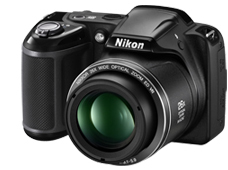 Both models are equipped with a 5x optical zoom NIKKOR lens and, the L30 offers a high effective pixel count of 20.1-million pixels, and the L29 16.1-million pixels. All four models, the L830, L330, L30 and L29, are powered by AA batteries readily available almost anywhere. Despite being equipped with a 34x optical zoom NIKKOR lens that covers a broad range of angles of view, from the wide-angle 22.5 mm to super-telephoto 765 mm (both equivalent focal lengths in 35mm  format), the L830 has a very compact body measuring approximately 111 x 75.8 x 91.2 mm* (W x H x D). In addition, it is equipped with Dynamic Fine Zoom, which enables 68x zoom with which resolution is preserved throughout the digital zoom range. The camera is equipped with a tilting monitor that supports shooting from a wide variety of angles. The high-resolution, approximately 921k-dot TFT LCD monitor offers a clear and vivid display. In addition to the lens-shift and electronic vibration reduction functions available for capturing still images, the L830 is equipped with a new five-axis vibration reduction function that combines lens-shift vibration reduction with electronic vibration reduction for movie recording. *Lens-shift vibration reduction compensates for camera shake with which the camera tilts slightly to the left and right, or forward and back. Electronic vibration reduction compensates for camera shake with which the camera moves slightly to the left and right, up and down, or in a somewhat circular motion up and down and left and right. This function, which combines compensation for all of these types of camera shake, enables effective vibration reduction under a wider variety of circumstances. In addition, 1920 x 1080/60i movies with stereo sound and superior picture quality, made possible with the suppression of blur caused by camera shake or subject movement, can easily be recorded by simply pressing the camera's movie-record button. *5-axis vibration reduction is available with movie recording only. The L830 continues the elegant design of popular high-power zoom L-series cameras, but sharper edges express a more precise and innovative image. A grip that offers a more steady hold and improvements to the position, angle, and shape of the shutter-release button for better operation have resulted in a form that makes the camera even easier to use. It is also equipped with a side zoom control convenient for movie recording. 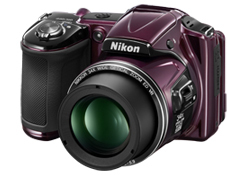 The camera is available in 3 colors: black, red, and plum. The L830 can be powered by AA alkaline batteries that are easily replaced when out and about or on vacation, AA rechargeable Ni-MH (EN-MH2) batteries that can be used over and over, or lightweight, high-capacity AA lithium batteries, which support capture of more than 1,000* photos. The L330 is equipped with an effective pixel count of 20.2-million pixels for capturing high-definition images. Despite being equipped with a 26x optical zoom NIKKOR lens that covers a broad range of angles of view, from the wide-angle 22.5 mm to telephoto 585 mm (both equivalent focal lengths in 35mm  format), the camera is very compact. This camera makes capturing a wide variety of everyday scenes, from wide-angle to telephoto, simple. Equipped with a lens-shift vibration reduction (VR) function, the L330 reduces camera shake, even with hand-held shooting. This function offers high-precision compensation for even the slightest camera shake, allowing users to enjoy more stable, worry-free shooting. Adoption of a large and clear 3-inch, approximately 460k-dot TFT LCD monitor makes viewing photos and applying camera settings even easier. In addition, anti-reflection coating makes viewing images easier and enables sharp, clear menu displays, even outdoors under sunny skies or indoors under bright lights. The camera is equipped with Easy Auto mode, with which the user need simply point the camera at the intended subject, and the camera automatically identifies the scene and shooting conditions, and then applies the optimum scene mode for easy capture of images as intended. It is also equipped with a movie-record button on the back of the camera, enabling simple recording of 1280 x 720 HD movies. The L330 is designed with a form similar to that of digital SLR cameras, yet is compact despite being equipped with a 26x optical zoom NIKKOR lens. The L330 can be powered by AA alkaline batteries that are easily replaced when out and about or on vacation, AA rechargeable Ni-MH (EN-MH2) batteries that can be used over and over, or lightweight, AA lithium batteries, which support capture of approximately 960* photos. The L30 is equipped with an effective pixel count of 20.1-million pixels and a 5x optical zoom NIKKOR lens that covers the wide-angle 26 mm to 130 mm range of angles of view (equivalent focal lengths in 35mm  format). This camera makes capturing everyday scenes, from group photos and snapshots to landscapes, easier than ever. The 3-inch TFT LCD monitor with anti-reflection coating built into the camera is clear and easy to see when viewing images or menus with shooting. The camera is equipped with Easy Auto mode, with which the user need simply point the camera at the intended subject, and the camera automatically identifies the scene and shooting conditions, and then applies the optimum scene mode. Eight Glamour Retouch options—Skin Softening, Small Face, Big Eyes, Brighten Faces, Hide Eye Bags, Whiten Eyes, Whiten Teeth, Redden Cheeks—allow users to retouch images to create memorable portraits that emphasize a person's image and expression. Brightens the white portion of eyes. Applies a rouge effect to cheeks. Four colors are available. Reduces the look of shadows under eyes. The elegantly curved design not only turns heads but also contributes to comfortable holding. The L30 can be powered by AA alkaline batteries that are easily replaced when out and about or on vacation, AA rechargeable Ni-MH (EN-MH2) batteries that can be used over and over, or lightweight, AA lithium batteries, which support capture of approximately 950* photos. The L29 is equipped with an effective pixel count of 16.1-million pixels and a 5x optical zoom NIKKOR lens that covers the wide-angle 26 mm to 130 mm range of angles of view (equivalent focal lengths in 35mm  format). It is a model that enables simple capture of everyday scenes. A large and clear 2.7-inch, approximately 230k-dot TFT LCD monitor has been adopted. Filter Effects can be easily applied to photos already taken without using a computer. Users can enjoy five Filter Effects—Cross Screen, Fisheye, Miniature Effect, Soft, Selective Color. The L29 can be powered by AA alkaline batteries that are easily replaced when out and about or on vacation, AA rechargeable Ni-MH (EN-MH2) batteries that can be used over and over, or lightweight, AA lithium batteries, which support capture of approximately 650* photos. *Number of shots indicated for AA lithium battery life is the number of shots possible when AA Energizer® lithium batteries are used.